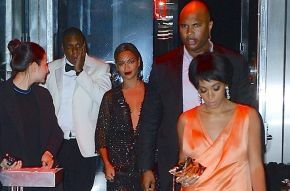 Jay-Z is attacked by sister-in-law Solange Knowles in an elevator while Beyonce stands by. Footage has been leaked through website DMZ of a security camera video in an elevator which appears to show Jay-Z being repeatedly kicked, slapped and punched by sister-in-law Solange while Beyonce stays on the sidelines. Although singer Solange is restrained by a bodyguard, this does not stop her from attempting to kick at rapper Jay-Z. Jay-Z is seen to attempt his own restraint by holding on to her foot. Apart from this one attempt, Jay-Z is not seen fighting back. Strangely, Beyonce seems quite quiet throughout the drama, moving only once to intervene and move the train of her couture dress out of the line of fire. The bodyguard accompanying the trio is seen pressing the emergency button as the lift reaches the 12th floor, presumably in an attempt to stop the fight from being seen from the press waiting below. The three stars were attending an after party for the highly prestigious Met Ball at The Standard Hotel, which was attended by stars such as Dita Von Teese. Pictures emerging from the ball show Beyonce, Jay-Z and Solange enjoying themselves which only makes the attack more mysterious. When the three left the building, photos show Jay-Z looking dazed and confused while Beyonce tries to keep calm with a vacant smile. Strangely, the Crazy in Love singer leaves with her sister rather than her husband and father to child Ivy-Blue, while Jay-Z is escorted to another car by security. This leads to question over what Jay-Z has done to deserve the attack and to be left to travel home alone by his wife. The cause of the fight is yet to be explained but a spokesperson at the hotel has released a statement regarding the leak of the footage.